Just learning to use a Smartphone is a piece of cake for kids and the more senior citizens, so too we’ll all swiftly and intuitively grasp the functions of the “Axor One”. 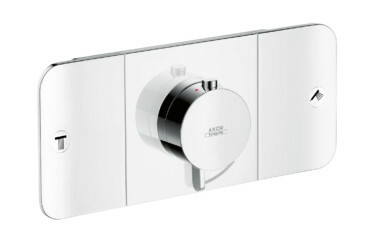 Because the thermostat module for showers and bathtubs that Hansgrohe SE’s design brand Axor launched last September combines not only controls for several shower settings, water temperature and water flow in a single unit, it likewise revolutionizes how such controls are used. 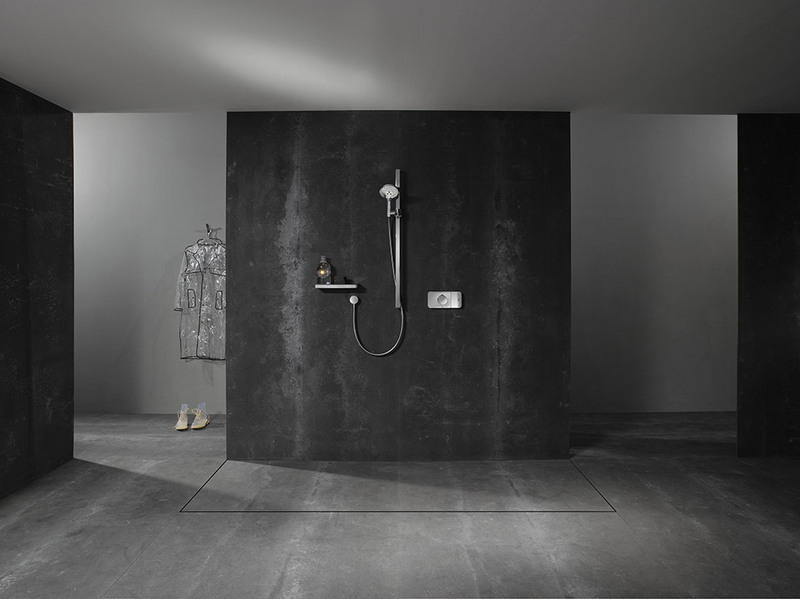 In fact all you have to do is depress the large-size select buttons (they boast symbols for added simplicity): Simply tap them with a finger or elbow and the water flows – and you can choose between a hand-held, side-spray, or a rainfall shower. There’s a central dial to adjust the temperature, and a lever to regulate the water volume. 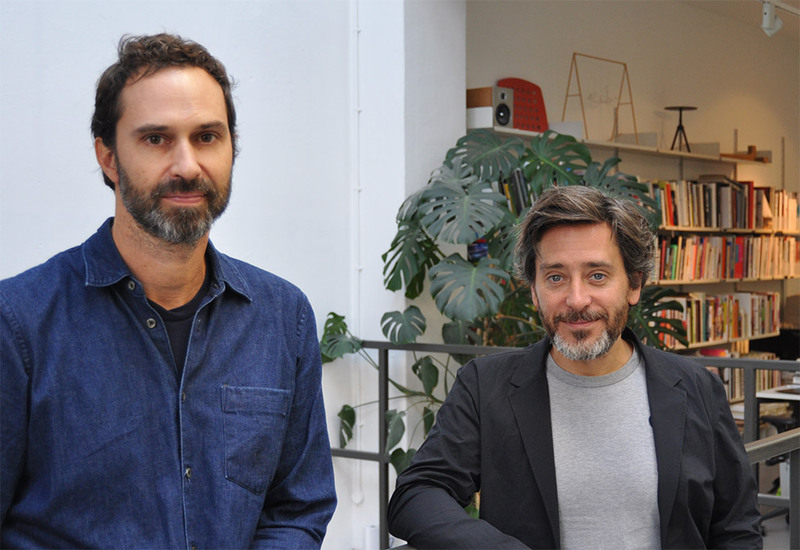 Martina Metzner talked to Edward Barber and Jay Osgerby, the two designers of the “Axor One”, about the innovative idea behind it all, what it was like working with the experts at Axor in Schiltach and their very personal feelings on water. Martina Metzner: What is water to you? Edward Barber: I loved water from a young age. Swimming in the sea, sailing, diving. I also find controlling water interesting. I could swim out in the sea and swim to an island, disappear over the horizon. It signifies freedom for me. A beautiful sea: nothing more enjoyable than that. Jay Osgerby: I am very unlike Ed, one of the few things we do not have in common. I really don’t like water. Fine for making coffee or in different states like ice. I am not a water person. Going into the sea is my worst nightmare. Actually there is something quite mysterious about water. We are working on an exhibition about graphene – a new material made from graphite. Its molecular structure is incredibly dense, harder than diamonds – a barrier. But the weird thing is that water can go through it, although it shouldn’t. And so it sparks the question about the physics of water: what is water? Philippe Grohe, head of AXOR, often speaks about the emotional aspect of water. What does it mean as regards your new control element Axor ONE? What is functional, what emotional? Barber: What we’ve produced is not really enhancing an emotional tool. The water itself is emotional. When you‘re tired, hungover, and then you go into water you feel a hundred times better when you come out. Axor ONE is about the way it is controlled. Osgerby: The main thing about Axor One is to incorporate four disparate things in a single control system. 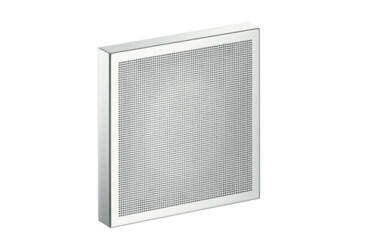 It is simple to use and simple to install. I’ve tested it already: Turning the water on is one step, and regulating the output of water is another step – before it was on one fluid step. So what’s the advantage? Osgerby: That’s not quite right. 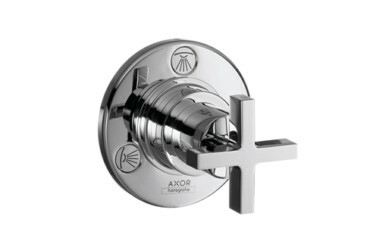 Axor did research and found out that most people just put the shower on. This is the case in most countries with medium water pressure. Germany is an exception, because the power in the system is always really high. So the volume control is a clearly second level and we’ve put it underneath. Barber: It reduces the anxiety of being confronted with a lot of options. You just click the switch and you have the right volume and temperature immediately. 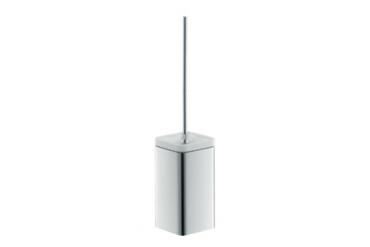 You relate Axor ONE to a light switch for light. 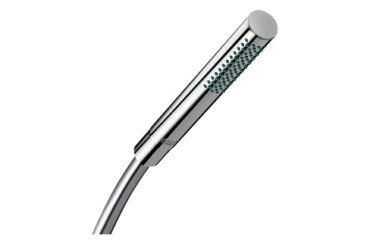 Barber: Before, to use water in the shower you turned a screw to shut it off and turn it on. 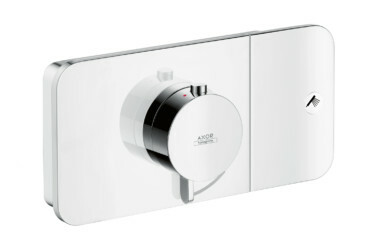 Now we’ve found a new technology and we wanted to embrace it with Axor ONE. When we started on the project we thought of having an electronic select. But it didn’t add anything as we still had to click a switch. And it simply made things much more expensive, more complicated. So we abandoned the electronics. Now you just click and can turn it off easily even with your arm – so think of immobility or of people in a later stage in life. 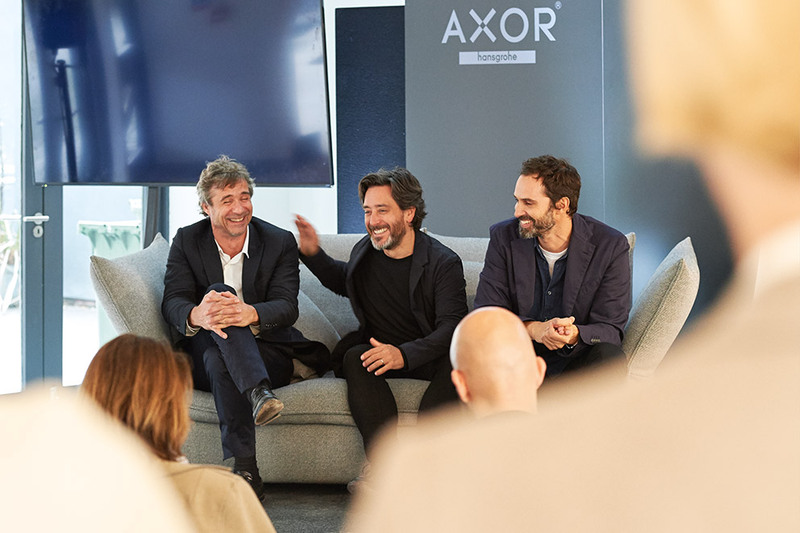 Was it a challenge to convince Axor? Barber: They love the challenge, especially Philippe Grohe and the engineers. If you give them something new, complex to work on, for them it is great. 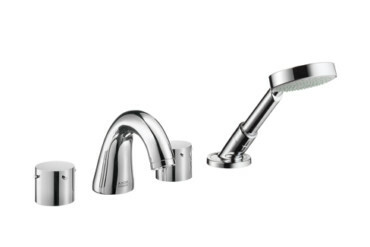 Giving them another tap is not about styling, but about what is inside. 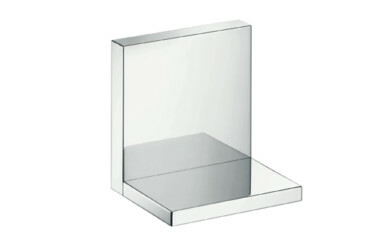 Speaking about the aesthetic aspect of Axor ONE: it looks like an iPad or an iPhone. The first time I tested it, I pushed the round button as if I were using my iPhone – but nothing happened. Did you think of that? Osgerby: It was never designed as a screen. 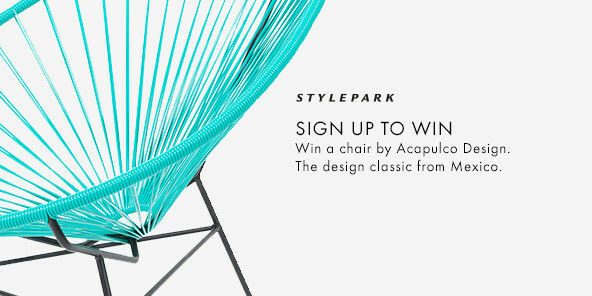 It is the whole thing we have designed – the back and the front. The point touch - we just had to put the demarcation on it. Barber: In terms of visual design, we had to reduce, reduce, and reduce. At the beginning we didn’t imagine for a moment that we had to connect the control to other components. 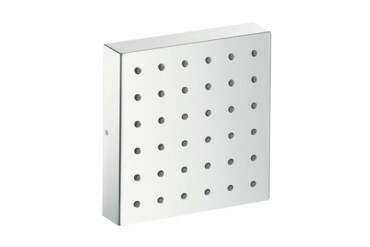 We thought we would design a range, the shower, the handshower and so on. 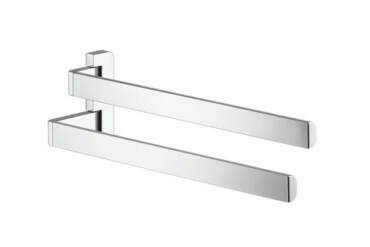 During the work process, Philippe Grohe said to us, this is really smart and he asked us why it couldn’t be used with the entire AXOR existing collection? Osgerby: Yes indeed. The reason why we didn’t launch the entire range at once and at the same event is that Axor think that it is such a great idea. And there would have been too much information for one event. 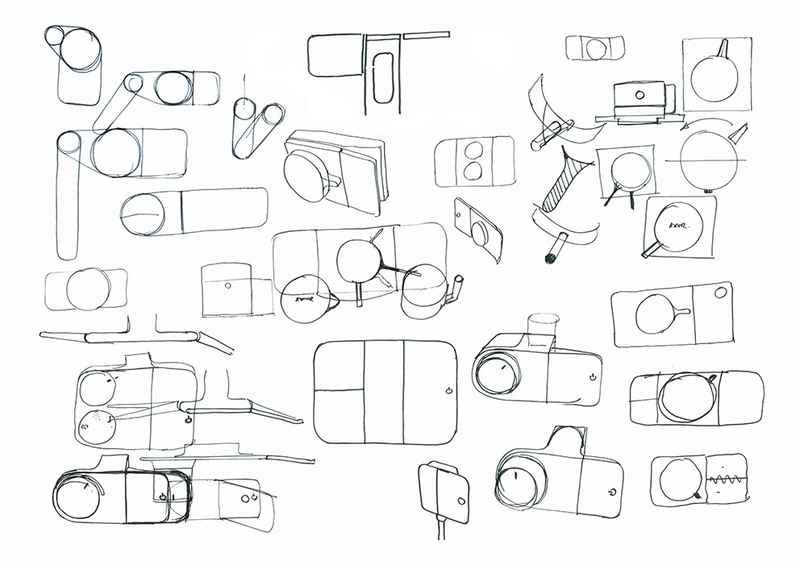 Because all the other things we are designing for Axor are also about reinventing and challenging the shower. Each thing is quite different. The whole range will be presented at ISH in 2017. Axor ONE seems quite big in the shower. Why couldn’t it be half the size? Barber: Now that’s an interesting point. It was half the size at the beginning. But discussing it with Axor it became clear that the control element needs more substance. 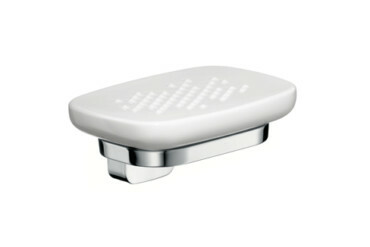 And it needs to have a certain size – otherwise you just feel you are pushing a button. 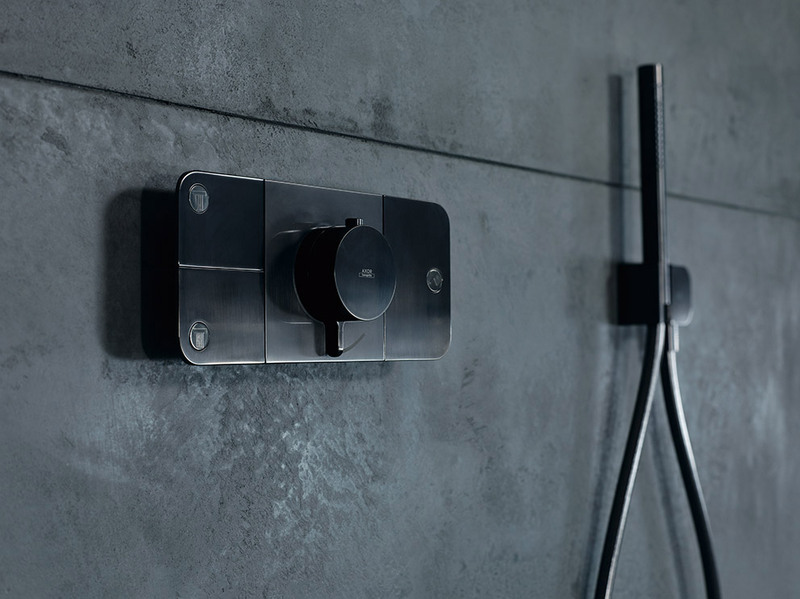 Osgerby: And we had to look at what is inside in order to combine the four elements that are normally separate in a single unit: the on-off-switch, a thermostatic control, a flow control and then the different shower heads. So it’s pretty packed. Talking about the testing phase: You went to Schiltach and had a shower? Osgerby: Yeah. There are twenty or thirty shower rooms, with different tools. They have a whole building where they test things, called the ‘Aquademy’. 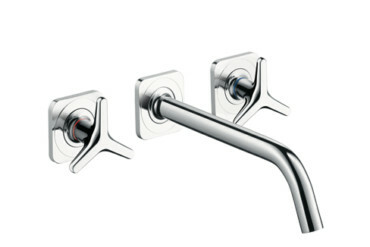 A lot of Hansgrohe employees tested Axor ONE for a year and a half. And they loved it. 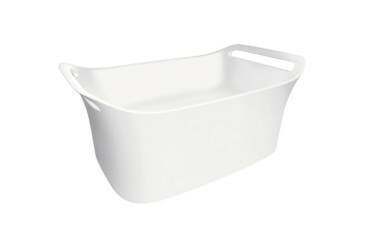 The sanitary industry and especially Axor seek to design long-term products. 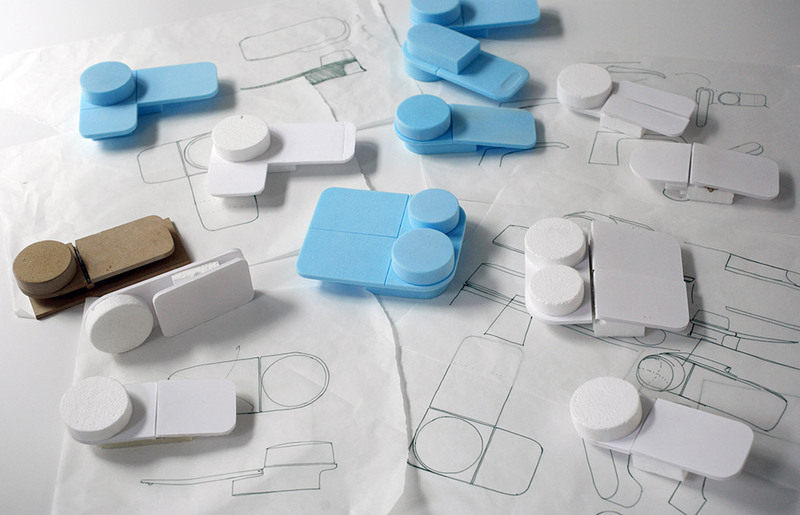 Which fits well with your designing approach, doesn’t it? How long will Axor ONE last in the shower? Osgerby: I asked Philipp Grohe how long the lifecycle for such a product is – and he said he couldn’t be sure, because they haven’t been able to test it yet. It could be that it lasts 50 years. I think this might be good for 20 years – because people redo the house every 20 years, at least in England. Barber: If you design this or something else like the Tip Ton chair for Vitra, then you want it to look as good in 50 years as it looks now. We don’t want to be very stylish or in line with a trend now, but more objective. This is what we always do. 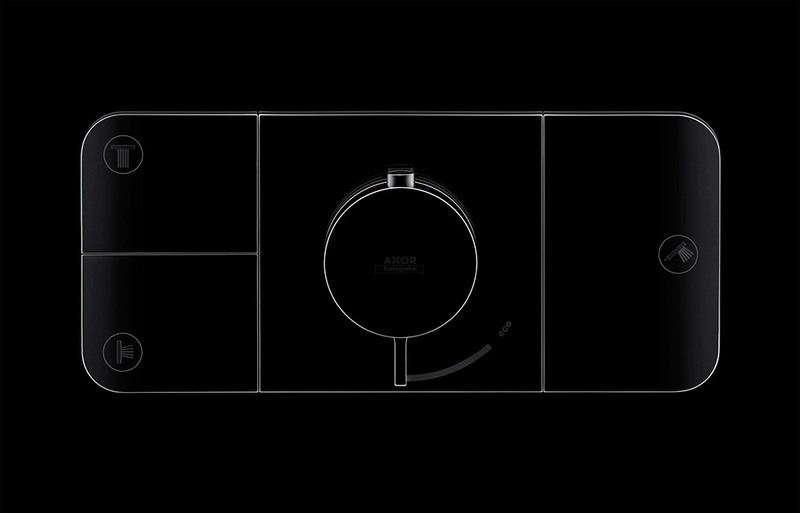 In the form of the “Axor Starck V” fountain mixer, Axor, Hansgrohe SE’s design brand, is entering virgin territory and conjuring up a vortex in bathrooms. 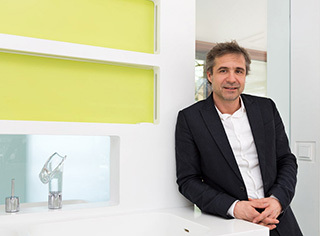 Thomas Wagner talked to Philippe Grohe, MD of the Axor brand, on flowing and calm water, on vortices and other ways of making water a sensible experience. 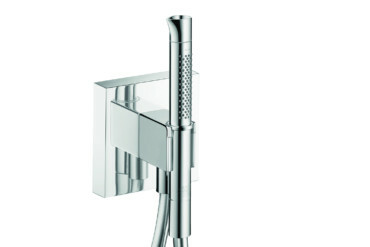 Just what does a shower need for the daily ritual to please all the senses? 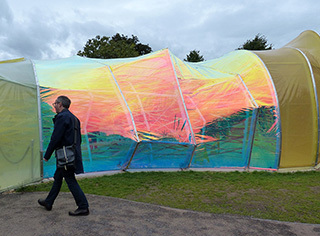 Surprisingly little, the designers Edward Barber and Jay Osgerby decided.